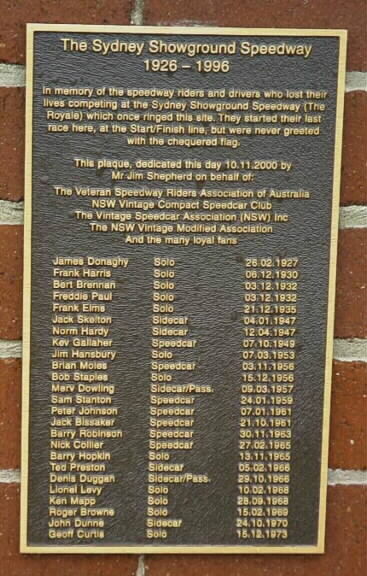 On Sunday 19th November 2000 the hands of time were turned back when Fox Studios (who now own the old Sydney Showground site) allowed veteran speedway devotees to pay tribute to 25 competitors who lost their lives competing at the "ROYALE" with the official unveiling of a brass plaque in their memory. The plaque overlooks the former starting tapes, alongside the Suttor stand (built in 1909) which is now a cafe restaurant. Unfortunatey, the brass plaque has proved to be incomplete. 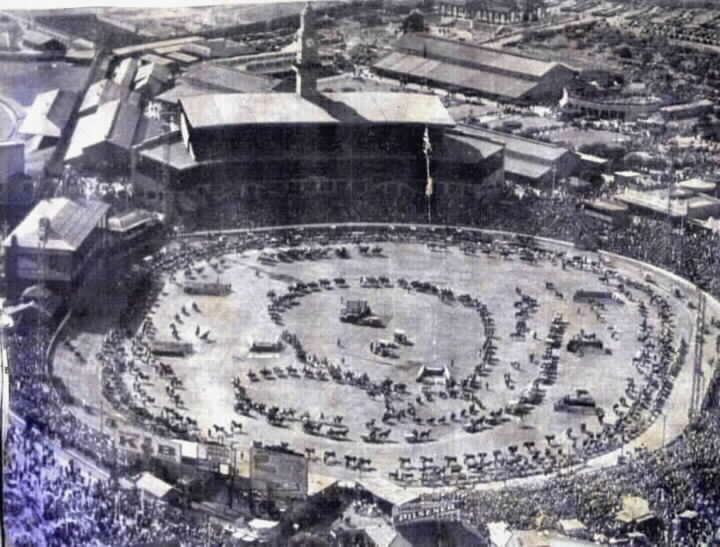 The Showground as it was in 1934 with the Easter Show Grand Parade in progress. IN THE FOLLOWING PAGES YOU WILL SEE SOME PHOTOGRAPHS OF SOLO MOTORCYCLES AND SIDECARS COMPETING AT SHOWGROUND "ROYALE" SPEEDWAY. THESE PHOTOS DATE FROM THE MID 50s. TO MID 60s. AND ARE FROM MY COLLECTION. SOME OF THE RIDERS WILL BE WELL KNOWN TO PEOPLE AS THEY TRAVELLED INTERNATIONALLY, OTHERS DID NOT. 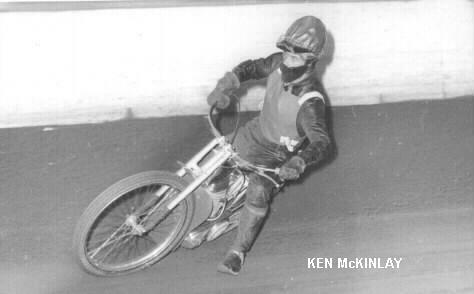 IN THE GOLDEN DAYS OF THE "ROYALE" STRICT PROTOCOL WAS FOLLOWED IN THE RUNNING OF EVENTS, SOLOs AND SIDECARS FIRST, FOLLOWED BY THE SPEEDCARS THEN THE STOCKCARS & HOTRODS. 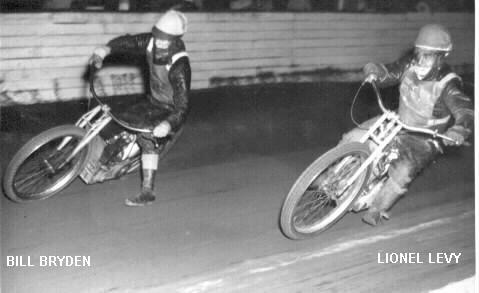 SPEEDWAY MOTORCYCLES, TO THIS DAY ARE NOT EQUIPPED WITH BRAKES AND RELY ON THE RIDERS ABILITY TO AVOID INCIDENTS. THE 3 LAP CLUTCH START RECORD (1 MILE) OF THE SHOWGROUND STOOD AT 59 SECONDS FOR SOLOS AND 64 SECONDS FOR SIDECARS. THE SHOWGROUND CLOSED TEMPORARILY IN 1981 AND REOPENED IN 1988 BUT WAS FINALLY SENT INTO OBLIVION ON 27th. APRIL 1996. A page for the 1988 & 1994 YEARS has been added as well as a MEMORABILIA PAGE for you to look at. If you have any memorabilia relating to the Showground,send it in by CLICKING HERE. A new page of pictures added on 19/8/99. These a shots of riders sitting on their bikes c.1946. Click"HERE"for this page.